If so, your target element might be in an IFrame. What appears to be a single web page may actually be a collection of pages – a parent page with a number of child pages embedded within it. The <iframe> tag is used to accomplish this – it can be used for variety of purposes, but is most commonly used for authentication controls and embedded ads. Here you can see that there is a complete HTML document embedded inside an <iframe> tag within the page. 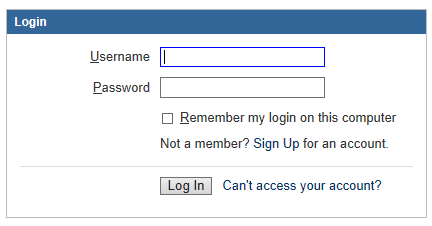 The (collapsed) body tag of the login panel is highlighted. Hidden below that is the username field from above. When Load Tester searches for an element, it can only look in a single document (web page). Since the username field resides in a separate document, the locator fails. In the example of our support system login and many other sites, Load Tester will detect the IFrame and create a working Select Frame step. Nonetheless, many testcases will require manual configuration of this step. See the Supported Operations page for more information about Load Tester’s IFrame support.